Welcome everyone to THE EARFUL, a delicious piece of new content from the minds over at the OH NO RADIO SHOW. This bonus show will feature a countdown of songs we have been enjoying within our ONRS community giving you all a taste of musical variety and maybe even turning you onto to something you'll like! We hope to do these shows often and would love your feedback and input as well on what we should be listening to. 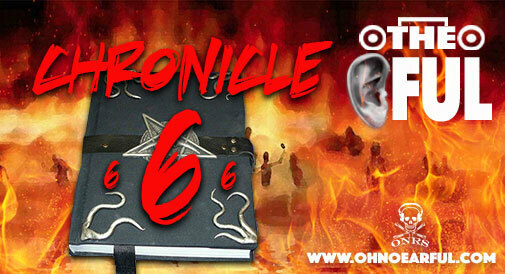 So bring on CHRONICLE 6 (DEMON VOICE) of the Earful. Zuco 103 is a Dutch musical ensemble which plays music chiefly in the styles of brazil. Phantoms are a Los Angeles-based electronic dance music duo.The group is composed of Kyle Kaplan and Vinnie Pergola. Royal Blood are an English rock duo formed in Brighton in 2013. The band's sound is reminiscent of and rooted in modern blues rock, hard rock, garage rock, stoner rock and psychedelic rock. "So our sponsors demanded we come up with a new segment so we did! Under The Covers pits the original performer of the song off against the artist who covered the same song. Who did it better? We discuss…." ALSO MAKE SURE TO CHECK OUT OUR SPIFFY NEW SITE RIGHT OVER HERE!!! AND WHATCHA THINK OF OUR NEW LOGO? PROPS TO TY GUY FOR THIS CONCEPTION. BRANDING THIS BEAST BABY! This entry was posted on Monday, May 22nd, 2017 at 10:52 am	and is filed under DefaultTag. Next: ONRS - EP 297 - Dolphins Have Buttholes and Bowling.